Burmese amber has provided scientists with some remarkable evidence of some of the smaller creatures that co-existed alongside the dinosaurs during the Cretaceous. Trapped in, what was once tree resin, insects, mites, seeds, spiders, pollen grains and such like have enabled scientists to build up a fascinating picture of life in miniature at a time when the Earth was dominated by huge reptiles. Writing in the academic journal “Current Biology” a team of scientists including researchers from Rennes University, Kansas University and the Nanjing Institute of Geology and Palaeontology (Chinese Academy of Sciences), have shed light on the evolution of the humble ant. 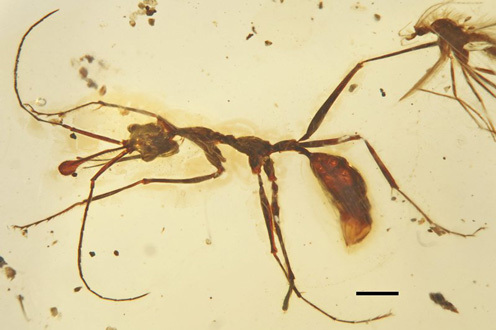 The preserved remains of a new species of basal ant (Ceratomyrmex) in Burmese amber. Measuring around one centimetre in length, the ant possessed a bizarre horn-like structure on the head and super-sized mandibles that probably evolved to tackle prey at least as large as the ant itself. 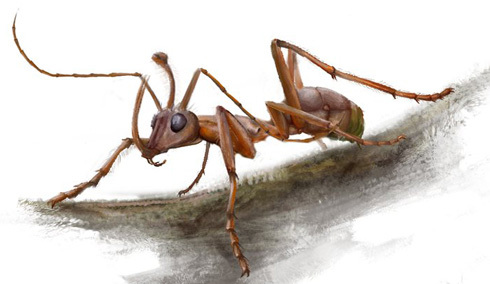 The new species of Cretaceous insect has been named Ceratomyrmex ellenbergeri (pronounced Sera-to-my-ah-mex) and the genus name is from the Greek for “ant with a horn”. Most ants today live in colonies and are eusocial, that is, the colony exhibits a great deal of co-operative behaviour and organisation. However, not all extinct ants were likely to be colonial, just like a few specialist genera around today, some were probably solitary hunters and the researchers suggest that Ceratomyrmex was a solitary, specialist hunter preying on Arthropods. The evolutionary history of the ant family is not well known, however, specimens preserved in amber, have, over last two decades, been extensively studied and it is now believed that the first ants evolved from wasps sometime between 110 and 130 million years ago. Described as a stem group ant and assigned to the Haidomyrmecini clade, Ceratomyrmex demonstrates that relatively early on in their evolutionary history ants evolved into highly specialised forms. The presence of such a bizarre horn-like structure and the oversized mandibles that actually extended over the animal’s head, features unseen in extant or any other extinct ant species known, provides evidence for more complex and highly diversified Cretaceous ant genera than previously thought. An illustration of the basal Cretaceous ant Ceratomyrmex. It is not known whether Ceratomyrmex was an arboreal hunter or whether it lived amongst the leaf litter. With such large jaws it probably was a formidable hunter, but what did it eat? For Vincent Perrichot, a specialist in the study of ancient insects, the answer is quite clear, the presence of the bizarre horn and the huge jaws had a macabre not mundane purpose.